RTA: Rebuildable tank atomizers. They have a tank to hold liquid that is absorbed by the wick. They can hold up to 4ml of e-liquid. The tank can be either plastic, glass, or metal. One form of tank atomizers was the Genesis style atomizers. They can use ceramic wicks, stainless steel mesh or rope for wicking material. The steel wick must be oxidized to prevent arcing of the coil. Another type is the Sub ohm tank. These tanks have rebuildabe or RBA kits. They can also use coilheads of 0.2ohm 0.4hom and 0.5ohm. These coilheads can have stainless steel coils. Kanthal wire is commonly used in RTA’s in addition to nickel or titanium wire for temperature control. 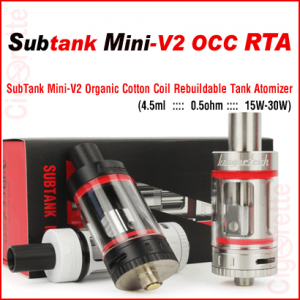 Hey Buddy!, I found this information for you: "SubTank Mini-V2 OCC RTA". Here is the website link: //www.cigorette.com/shop/atomizers/rba/rta/subtank-mini-v2-occ-rta/. Thank you.